We specialize in corrosion resistant tank linings for various manufacturing and delivery applications as well as containers and tank systems. Container materials include mild stainless steel and aluminum. Capabilities include coating of steel containment and related accessories and truck railings, double wall containment tanks, dual compartment containment tanks, stationary tanks, sumps, stands, hoppers and chutes. 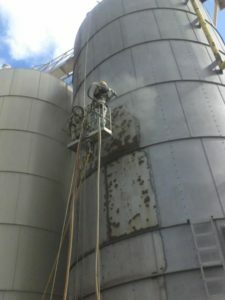 We also specialize in cleaning and coating all types of storage silos. USDA, FDA, NSF, and other specifications strictly followed. Silos are abrasive blasted or high pressure washed to a clean, sound surface suitable for coating. Rust resistant primers, epoxy or alkyd, are applied to assure corrosion resistance. Finish coats are formulated with polyurethane, for durability, color fastness, and gloss retention.